Thursday, May 24, 2007Â at Therapy Nightclub with DJs Adam Jay, Jackola, Molly G, and Dozuki. PLUSH is 21+ with no cover and weekly drink specials. My friends and I have joined forces in promoting electronic music. The result is sideTrack. We’re starting with a weekly at Therapy Nightclub & Lounge, as well as a big event at Therapy during the week of Indy’s Gay Pride celebration. DJ gig – this Thursday! 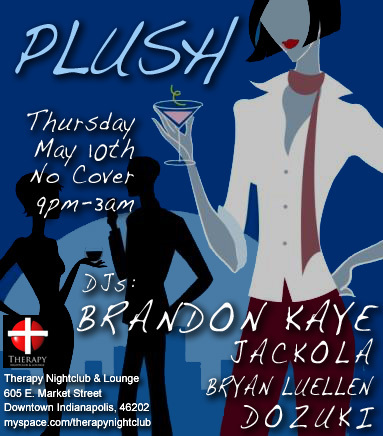 PLUSH @ Therapy Nightclub with DJs Brandon Kaye, Jackola, Bryan Luellen and Dozuki. Therapy is 21+ and this event will have no cover.